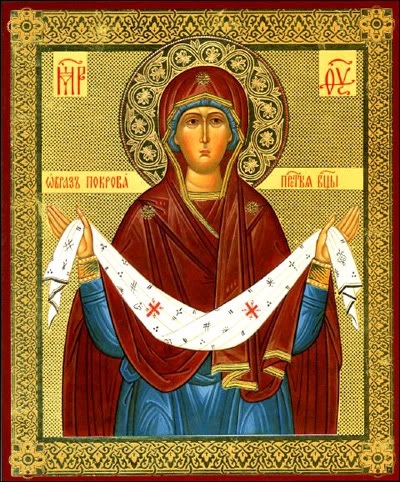 Troparion: Most holy Mother of God, today we Orthodox joyfully celebrate thy coming among us. As we gaze at thy icon we cry with compunction: Shelter us under thy protection, deliver us from evil, and pray thy Son Christ our God to save our souls. Kontakion: Today the Virgin is standing before us in the Churchpraying for us with the choirs of Saints. Angels worship with Hierarchs, Apostles rejoice with Prophets, for the Mother of God intercedes with the Eternal God for us. The Church has always glorified the Most Holy Mother of God as the Protectress and Defender of the Christian people, entreating, by her intercession, God's loving-kindness towards us sinners. The Mother of God's aid has been clearly shown times without number, both to individuals and to peoples, both in peace and in war, both in monastic deserts and in crowded cities. The event that the Church commemorates and celebrates on October 1 [October 14, Civil Calendar] proves this constant protection of the Christian people by the Mother of God. On October 1st, 911, in the time of the Emperor Leo the Wise (or the Philosopher), there was an all-night vigil at the Blachemae church of the Mother of God in Constantinople. The church was crowded. St. Andrew the Fool for Christ was standing at the back of the church with his disciple Epiphanius. At four o'clock in the morning, the most holy Mother of God appeared above the people with a veil spread over her outstretched hands, as though to protect them with this covering. She was clad in gold-encrusted purple and shone with an unspeakable radiance, surrounded by apostles, saints, martyrs and virgins. Seeing this vision, St. Andrew gestured towards it and asked Epiphanius: 'Do you see how the Queen and Lady of all is praying for the whole world?' Epiphanius replied: 'Yes, Father; I see it and stand in dread.' As a result, this commemoration was instituted to remind us both of this event and of the Mother of God's constant protection whenever we prayerfully seek that protection, that shelter, in distress. This feast day is celebrated on October 1/14.